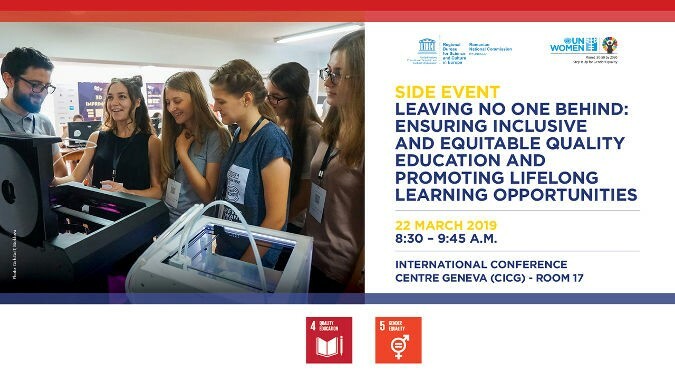 National Commission of Romania for UNESCO, in collaboration with UNESCO and UN Women, is organizing a side event «Leave no one behind: Ensuring inclusive and equitable quality education and promoting lifelong learning opportunities » on 22 March 2019 in Geneva. The side event will provide a platform to discuss intersections between gender equality and education in the UNECE region, based on the UNESCO report “The intersection of gender equality and education in South-East Europe: A regional situation analysis of the nexus between Sustainable Development Goal (SDG) 4 (quality education) and SDG 5 (gender equality)”, and the UN Women SDGs monitoring report “Turning Promises into Action: Gender Equality in the 2030 Agenda for Sustainable Development”. Bringing together governments, civil society, beneficiaries of UN programmes and youth, the event will identify and agree on how the intersectionality and the interlinks between SDG 4 and SDG 5 could be addressed by the States. To see the flyer click here.